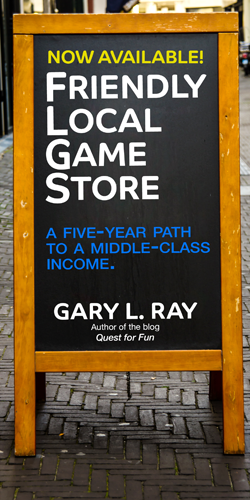 In 2009, I was standing in my role-playing department, wondering why Dungeons & Dragons wasn’t selling. We had several months worth of unsold D&D supplements. I was playing D&D at the time and they all seemed pretty good. I tried to figure out the problem, asking staff and customers, and it turned out it was because of Dungeons & Dragons Insider, the D&D online subscription service where you get the contents of all the books for $6 a month. Why spend $30 a month on the new D&D book when you can have ALL the books for $6? This made me a bit upset because I realized I had put D&D up on a pedestal. It got special treatment. My performance metrics were waved for the sake of carrying the full line. The books were placed on special racks. RPGA got preferential treatment. Wizards of the Coast was supposed to be my friend. They didn’t sell direct, which gave them special status in my mind. I mention this because some retailers won’t support Pathfinder because they feel Paizo is competing with them with direct and subscription sales. This is true, but all publishers are exploring multiple sales channels. It’s not a good enough reason to ignore something that could be making you a bunch of money and making your customers happy. My argument is NOT that we should knock D&D off its pedestal, removing its special treatment. My argument is that you can be very successful selling Pathfinder, if you elevate the game to the same status as Dungeons & Dragons. 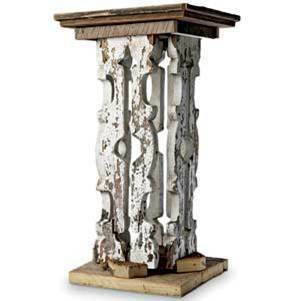 It’s a big pedestal. There’s room up there for both. Pathfinder is on the rise. 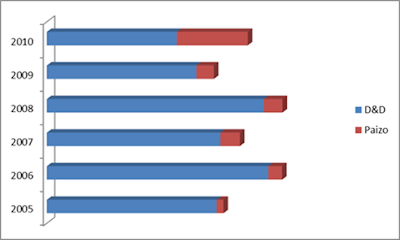 At the same time, most agree that D&D is faltering. As retailers, we don’t have to choose. We can and should support both games. These ICV2 numbers reflect what many distributors can tell you: Pathfinder sales are as strong or stronger than Dungeons & Dragons. That’s what’s going on now. But what about the future? 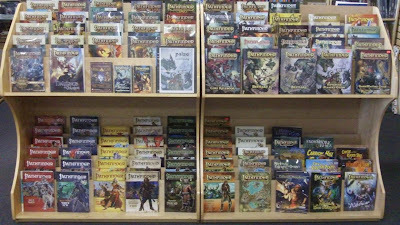 This is a photo of the 2011 releases for both Dungeons & Dragons (left) and Pathfinder (right). We have this posted on our drink cooler at the store. 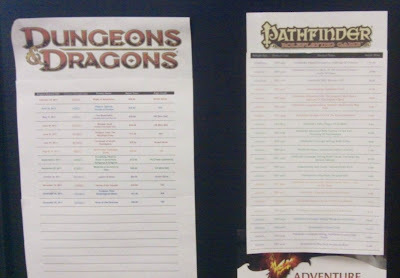 It shows about 12 releases in 2011 for D&D with 24 releases for Pathfinder. So if both games are tied, all things being equal, 2011 should see Pathfinder exceed D&D sales. Paizo comes out of the D20 glut and must shed the stigma that goes along with that. The key is to move it mentally from a third party publisher, the lowest of lows, to a first tier publisher like Dungeons & Dragons. You do this by giving it the resources you give D&D. Carry the full line. 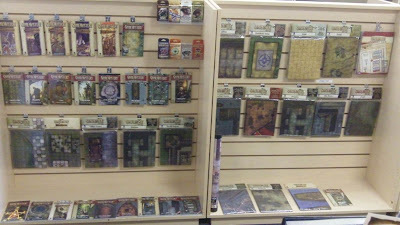 This includes every rulebook, supplement and adventure, as well as GameMastery products like flip mats and item cards. Why? You become the destination store and remove selection as a reason to buy online. Something funny happens when you carry the full line. Sales across the line accelerate. Map packs and other items that sat on the shelf for a year before we stocked deep, now sell 3-4 a year. The reality is that two-thirds of our sales are rulebooks, half a dozen hardcover products, but we were only able to sell those rulebooks in large quantities by having the full line to back it up. 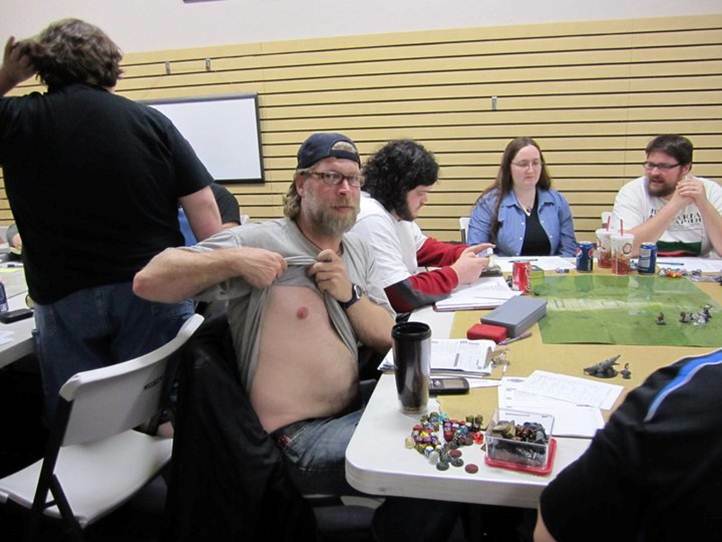 If you sell Dungeons & Dragons, you probably experience the same thing. You can’t just carry core rulebooks and expect to have strong sales. The supplements drive the whole line. When customers think Pathfinder, they should think of your store. It’s a combination of carrying the full line, merchandising the product in your premium spaces and marketing the product equally. When customers think of Pathfinder, make them think of you first, before Paizo, Amazon or your competitors. They need to know you’ll have the item they want every time. Pathfinder Society organized play is popular among the fans. They enjoy the format and the quality of the adventures. Promote it like the RPGA, but give the players a choice. Don’t schedule them at the same time, for example. 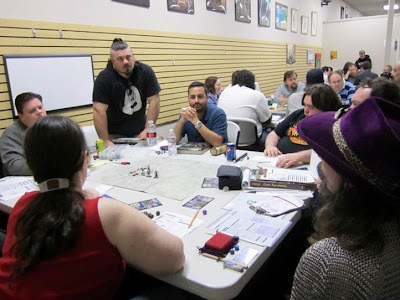 Pathfinder players and especially Venture Captains are amazing evangelists for their game. You’re an arms dealer in the version wars. Rather than being a cheerleader for one system, find the system that fits the customer and don’t give them an excuse to complain or get into pointless version discussions. Sell Dungeons & Dragons to those who want a BASIC, simple game and sell Pathfinder for those who want a more ADVANCED experience. When you offer good options, the problem to be solved is those who won’t move forward, and that’s where we excel, selling the excitement of a new game. Without Pathfinder, last years “D&D” sales would have been the lowest for us in six years. Instead we saw an increase in RPG sales. 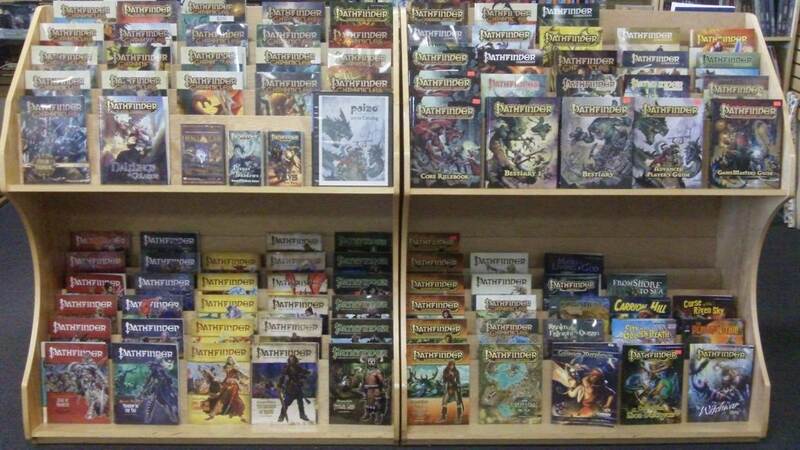 If you’re seeing your D&D sales tanking, Pathfinder might be what you need to shore them up. 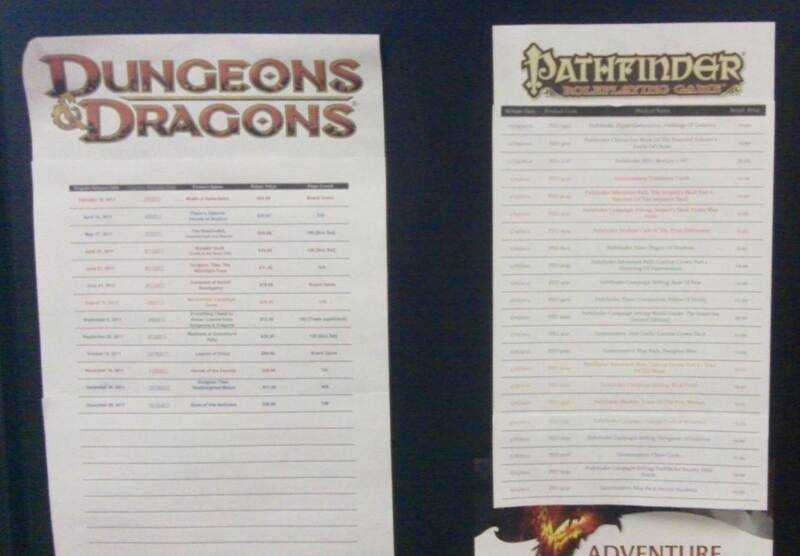 Pathfinder has turn rates comparable to Dungeons & Dragons. While only six of the over 160 Pathfinder products account for two thirds of our sales, overall line turn rates remain high at 4.6/year, compared to 5.1 for D&D. As I mentioned, performance of weaker merchandise accelerates when the full line is present. This is $2,633 at retail, which means for my store, it was $12,000 in sales from virtually nothing a year before. So the bottom line? Sell and support Pathfinder like Dungeons & Dragons and you should see good results.